CQRS is winning more ground these days, and it has several advantages over the more classic ways of communication. One of the biggest is that there are no more god service classes with hundreds of methods and URL’s. Most implementations I have seen with CQRS in web projects only leverage CQRS between the server-side web and the message bus/backend. The client still communicates with a standard web method that just redirects the calls to the message bus. Why not leverage the contract safety and other perks of CQRS all the way from the client to message bus? First we need to create the T4 template. We can not use reflection to get the Command and query types because a T4 template is executed at design time not runtime or compile time. Instead we have to use the tools found in the EnvDTE namespace to retrieve all the projects of the solution and their types. The problem with EnvDTE is that it’s a major pain to work with, but don’t worry, there are remedies out there. From the extension manager in VS install the Tangible T4 Editor, it comes with a T4 template with helper methods for the EnvDTE tools. 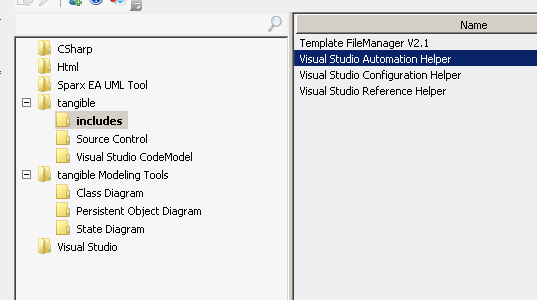 Include the Visual Studio Automation Helper from the Tangible editor. It comes with a helper class called VisualStudioHelper with a bunch of helpful methods to retrieve info from a project and its types. Even though VisualStudioHelper is very helpful we still need some custom helper methods written. You need to write a method that gets all types that inherit a specific base class or resides in a special namespace or any other convenient convention that fits your project . It should look something like this. First we create object closures for all namespaces and make sure they do not overwrite any existing closures. We also need some client code that can send the DTO’s, sadly the .NET WebApi that we use for this particular project does not support dynamic C# objects from arbitrary JSON objects so we had to send the DTO data as a string (Side note, vanilla JSON.NET that WebApi utilizes does support dynamic objects). You send a command or query like this. The server needs to create static typed C# objects instances, to do this we need to get a little creative with JSON.NET. First we declare a Data contract that WebApi is capable of deserialize to. Then we need to create a way of decoding that data into a real object instance of the correct static type. We use some JSON.Net magic for this. We get the Type object instance from the type string sent from client then we use JSON.NET to first create e dynamic object from the string data and then we use the ToObject method that uses reflection to create a static typed version of the dynamic object. We use the above method from our WebApi method like. Interesting to make the server ‘front-end backend’ a small pass-through for deserializing / serializing queries and commands, making the client side web application a true front-end like the traditional role of .Net MVC controllers / WebApi controllers. I can see how this speeds up rapid development, getting rid of unnecessary plumbing code in the WebApi, communicating directly with the backend ‘bus’. Have you thought of a security layer available that can hinder certain users from executing certain commands / queries? Hi Max. The project this was written for has zero domain logic, everything is sent to the main frame (zOS) backend. We do however send a header with the messages and the AD-user being one of them so the backend can do security checks there. Plus the site is protected with standard ASP.NET security.